Originally published by Freedom News, edited by Enough is Enough. 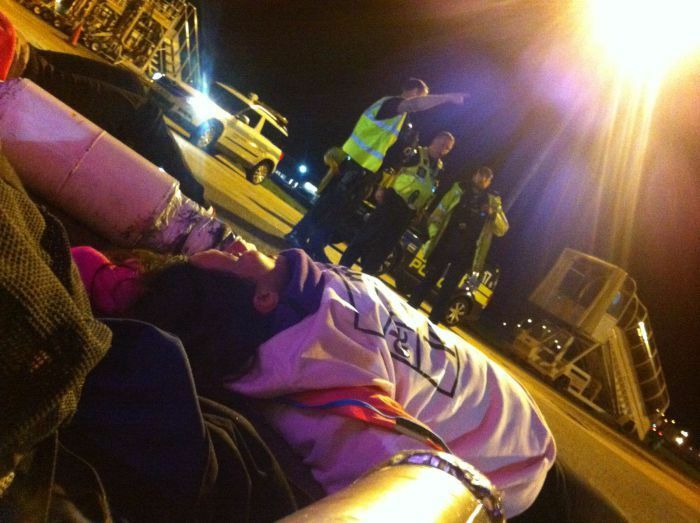 On Tuesday night the activists stormed the commercial runaway at Stansted and locked themselves to the wheel of the plane; this is the first time this kind of direct action has successfully stopped a mass deportation charter flight. The three groups involved were Activists from End Deportations – a campaign group fighting for the abolition of deportations and detention centres; Lesbians and Gays Support the Migrants (LGSMigrants) – an LGBT+ group inspired by the 1980s Lesbians and Gays Support the Miners; who take creative action to stand in solidarity with migrant communities and Plane Stupid, the latter being an ecological group whose previous actions have been against the aviation industry. Police say 17 people were arrested.